All prices include delivery to Yorkshire Coast Caravans and all on the road (OTR) charges. Whether you’re seeking exhilerating adventure or peace and tranquility, Swift caravans aim to make your holiday as comfortable and enjoyable as possible. 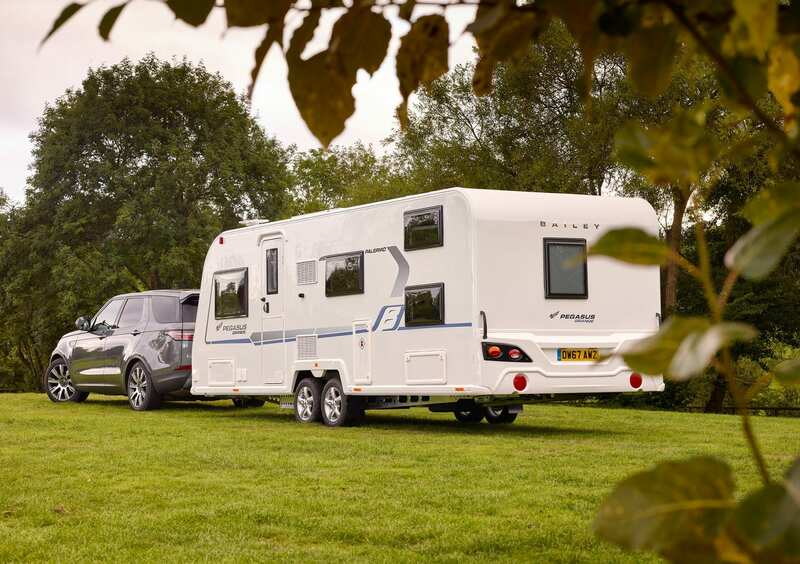 Swift are continually investing in design and innovation to make sure that each caravan is one of the most stylish, technologically advanced and practical caravans available. 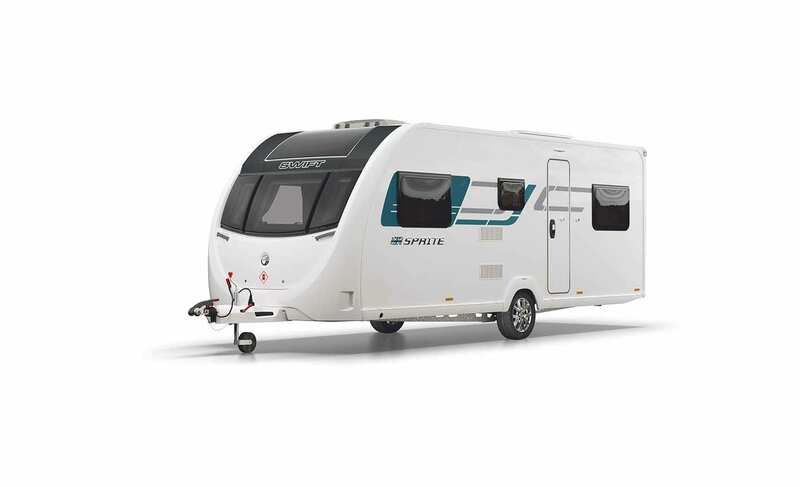 Sprite is the UK’s best-selling, multi-award winning caravan range. Built with industry leading SMART timberless construction, the Sprite is more durable making it an even better investment, and with ten layouts including four twin axle models. With stylish features which include LED exterior lighting, hail resistant roof and GRP outer skin on the exterior and positive locking catches on the lockers and soft close drawers on the inside. The Swift Command control system now comes with a larger 7″, easy to use, LCD colour touchscreen control panel with improved functionality and app interface. It now features integrated DAB and FM radio as part of the Diamond Pack. 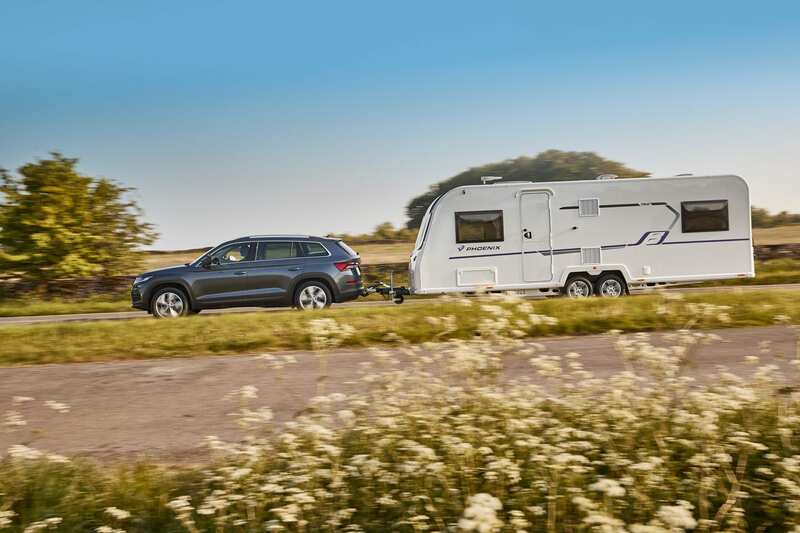 Peace of Mind: The option to subscribe to a pre-installed Thatcham Category 6 approved pro-active tracker provides added protection for your new caravan. Major 4 SB, 4 Berth Tranverse Island Bed, End Bathroom. Major 4 EB, 4 berth, rear island bed, middle bathroom. Renowned for its great looks, the Challenger has a New streamlined aerodynamic profile for 2019. Stylish carbon fibre effect, wide gas locker door, chrome effect grab handles, convenient one key exterior locks and exclusive bright LED road lighting. With nine layouts, including a New twin axle model with rear island bed and single axle models come in at an MTPLM of 1600kg or less. There are a number of refinements for the 2019 range, including new colour schemes and panoramic sunroof. Gloss high level lockers add to the stylish feel of the caravan and the fixed beds are topped with the Duvalay Duvalite mattress. Here at Yorkshire Coast Caravans, we order all our Challenger models with optional Alde wet central heating system. There are also a number of other cost options which help to personalise your new caravan further. The Elegance comes with New SMART 3 construction – the third generation of totally timberless SMART caravan construction featuring a New revolutionary floor construction and a lifetime water ingress warranty (subject to T&Cs). The expanded eight model range including three twin axle layouts. The interior is immaculately designed and cleverly detailed. Equipped with energy efficient LED’s, from front pillar lights to dimmable spots and New illuminated pelmets above side windows. Updated soft furnishings and even a leather option to tempt. The New domestic style kitchen is fitted with scratch resistant FENIX NTM® worktop, soft close drawers and doors, illuminated kitchen splashback and Dometic appliances including oven and a spacious tall fridge in most models. Fixed beds are topped with the Duvalay Duvalite mattress. Elegance 480, 2 berth, end bathroom. Bailey caravans have been developed using over sixty-five years of experience in caravan design and are manufactured in their state-of-the-art South Liberty Lane production facility to provide, what they believe to be, the very best in touring quality and value. All of Bailey’s products are built using their patented Alu-Tech construction system and incorporate the core Bailey values of award winning design, first class build quality and unbeatable value for money. 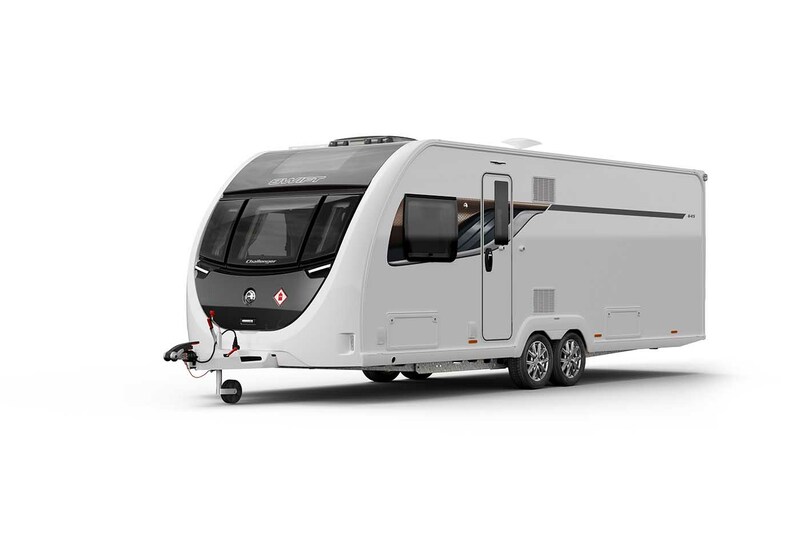 Plus to ensure that they remain some of the best-engineered and most technically advanced caravans available, Bailey subject them to a programme of continuous testing through leading independent experts which takes them as far afield as the Australian Outback and the European Alps. As a result, Yorkshire Coast Caravans are proud to present three distinct caravan ranges which offer something to suit every lifestyle and budget. 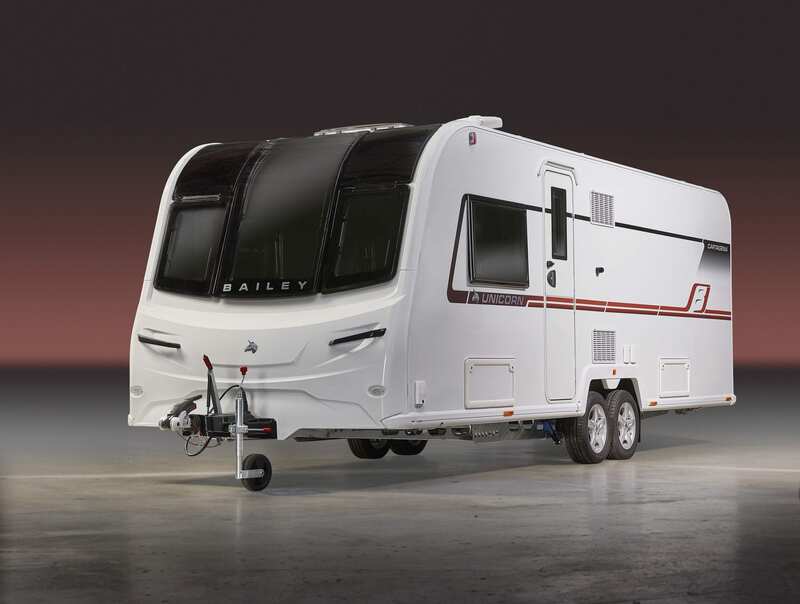 To help make an informed decision about which Bailey model will best meet your needs. New for 2019, the Bailey Phoenix is available in seven different layouts catering for both couples and families. With a warm coloured wood finish and contrasting ‘Brushed Champagne’ locker doors, there is a stylish and elegant feel to this entry level model. The Phoenix also boasts features which were previously limited to the mid-range Pegasus and range topping Unicorn models, items such as a full length vertical skylight, fully lined ‘Granite Stone’ shower cubicle, full oven with 4 hobs and USB sockets on the down-lighting, plus a number of cost options to up-spec your Phoenix. 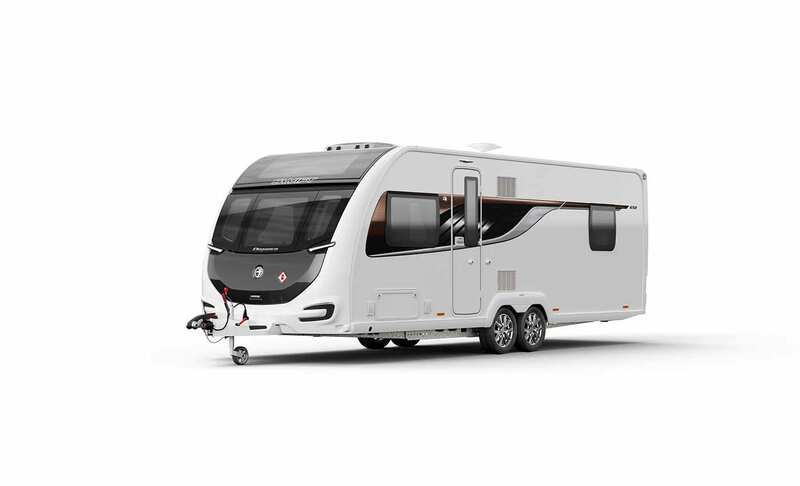 Not seen on the out-going Pursuit range, the Phoenix boasts 2 new island bed layouts – the 640 & 644, and a new twin axle layout – the 760. Weights are also a key benefit to the Phoenix, with 2 to 6 berths ranging from 1139kg up to 1600kg. New for 2019, The 8″ Wide Pegasus Grande comprising of 6 layouts. Two single axles, Pegasus Grande Rimini with the ever popular 4 Berth layout with two fixed single beds with rear washroom also The Brindisi with a Transverse Island bed with rear washroom. Four Twin axles. Two four berths comprising of the Pegasus Messina with a Rear central island bed and large centre washroom, Bologna with a Transverse Island bed and rear washroom. Two six berths a Turin with a rear fixed bed a large side dinette and spacious lounge and the Palermo ideal for young families with two fixed rear bunks again with the large dinette and spacious lounge. All include ATC Trailer Control, 100 Watt Solar panel, Truma Combi heating and the Tracker Retrieve Security system. Pegasus Grande Rimini, 4 berth, single beds, end bathroom. If you want to travel and arrive in style, then Unicorn is the caravan for you. Bailey’s most popular range of caravan is available in a choice of ten different layouts all of which provide the experienced caravan owner with the perfect blend of style and practicality. As you might expect Unicorn comes equipped with all the comforts of home, notably an Alde central heating system, to ensure that you get the most from your time away together. Unicorn Cartagena, 4 berth, transverse island bed, end bathroom. 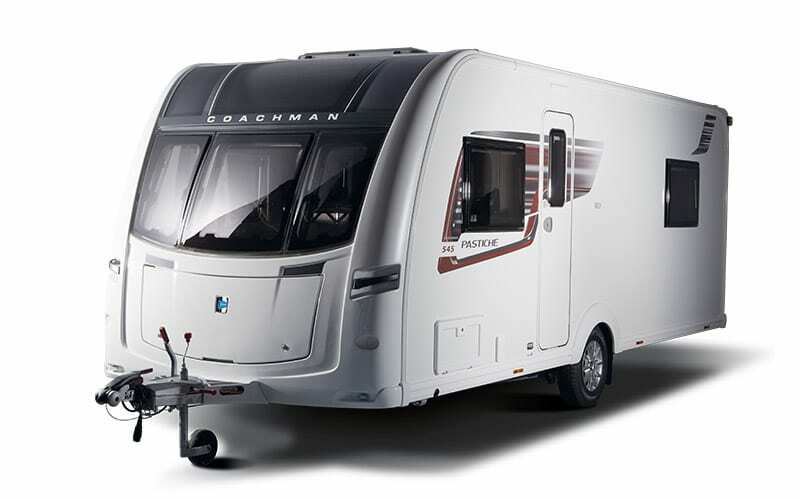 Coachman hold a reputation for producing luxurious, reliable and practical caravans which offer high-end specifications and flexible accommodation. Whether your travels take you on short breaks in the glorious British countryside, or sun-filled European adventures, the new models and layouts in their 2019 collection will allow you to find the perfect caravan to suit your lifestyle. 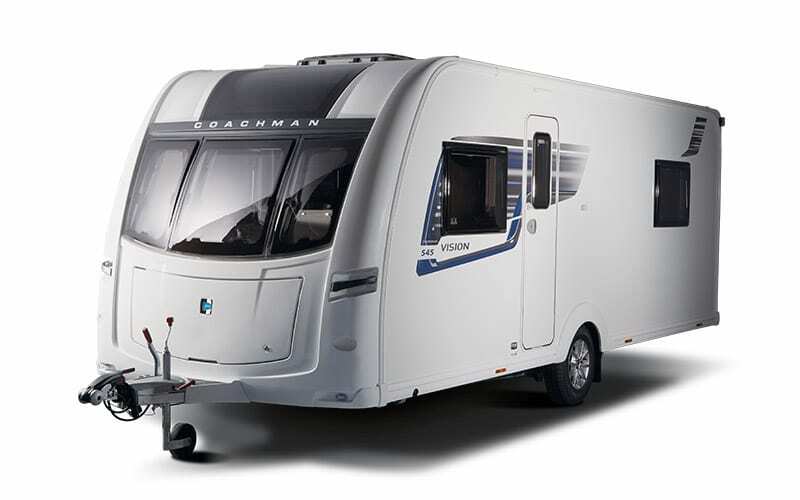 Whether you are a couple or a larger family looking for a caravan the Vision is designed to be spacious, flexible and practical while still offering the comfort and luxury you expect from Coachman. The well-planned interiors are packed with state-of-the-art features which offer all the comforts of home while you are enjoying your latest adventure together. With layouts from two to five berths available, the Vision can accommodate families of all sizes. Plus, weights are competitive meaning that more cars than ever can now tow a Coachman. You can relax knowing that there is no compromise on quality or comfort, letting you concentrate on making the most of your leisure time. 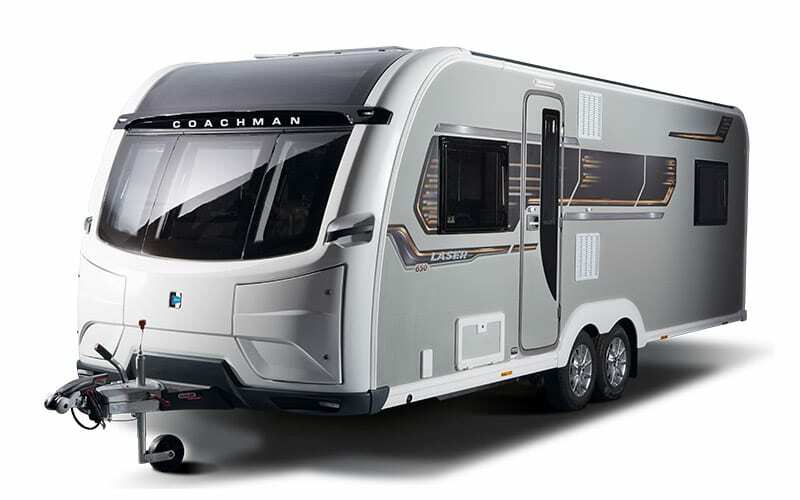 The 2019 season Coachman Pastiche combines spacious, versatile living areas with stylish features and sumptuous upholstery to create a luxurious comfortable space from which to explore. This season’s range is furnished with the very latest and innovative kitchen worktops; made from a super opaque nanotech material that combines elegant aesthetics with state-of-the-art technological performance. In addition there are new contemporary cranked style locker doors to the lounge and bedroom, as well as new luxury, premium quality FibreGuard fabrics which use the latest Stain Free Technology. You can enjoy year-round adventures, safe in the knowledge that you can keep cosy with the powerful Alde heating system. With a range of versatile layouts to choose from, you can find a model to perfectly match your requirements. The New VIP is Coachman’s flagship model range and is a luxurious home-from-home, packed with exclusive features that make it truly exceptional. All the layouts have been designed to create a range of caravans that are really special, combining a bold and vibrant exterior with a sumptuous interior. With generously proportioned kitchens and well-planned living spaces, the VIP combines luxury, comfort and style. There are 6 layouts to choose from, each meticulously engineered to ensure it meets Coachman’s exacting standards, including the 570 layout which will appeal to families. The VIP is a caravan that you’ll enjoy spending time in; it is truly a special range that stands out from the crowd. VIP 545, 4 berth, rear island bed, middle bathroom. The return of the highly sort after Laser takes luxurious travel to an all new level. Three new twin axle layouts for 2019 include the ever popular 675 transverse island bed with rear bathroom. the new 665 four berth with fixed rear single beds with a large central washroom. the new designed 650 boasted a rear of side transverse double bed with spacious central bathroom. The Laser is packed with extra features, a higher specification and more luxurious touches than ever before. All three new layouts have been carefully designed to offer individuality and optimum space without compromising on stylish, sumptuous living. Each of these four berth caravans has contemporary two-tone locker doors to the lounge and bedroom with soft close hinges, as well as modern new LED layered lighting. Additionally the 12v Seattle multi-function digital control panel gives you all the power at your fingertips. Laser 650, 4 berth, rear island bed, middle bathroom. Please check before travelling that a model of interest is still on display.